Leave it to me to forget things! 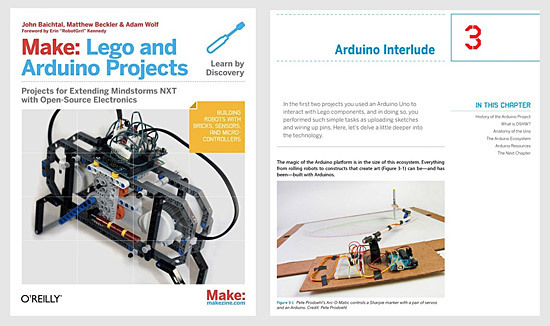 I forgot to mention that my Arc-O-Matic was mentioned in the book Make: Lego and Arduino Projects. Get to chapter 3 and you’ll see one of my photos. I should mention that I have not actually read the whole book, I ended up loaning it to someone who is way more into LEGO and Arduino stuff than I am, but if you want more info on it, WIRED has a nice write-up, and you can buy it from Amazon or directly from O’Reilly. John Baichtal (one of the authors) has another book in the works which I’ll have a hand in, but we’ll save that story for another time.